Finally it’s here. The hedgerow is blooming at last. 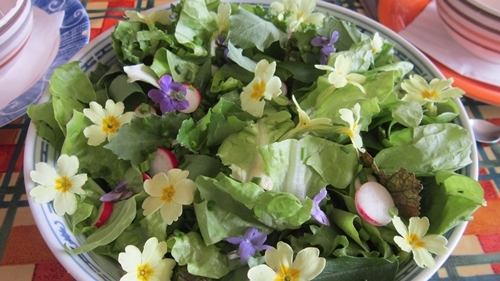 Nettles, wild garlic, hawthorne, primrose and violets ready to eat! I have the pleasure of giving a Hedgerow Cooking Class at Boghill for a journalist from the UK, who is doing an article on the Burren Food Trail and Boghill’s own Culinary week May 13-16. It was a challenge, given the late arrival of Spring this year in Ireland. But, we managed to pick enough wild edibles and fresh young greens and herbs from the gardens for a great learning experience and a delicious meal. I wanted to include a variety of recipes that are not only made from the food around Boghill but that are an example of the menus we create for clients with diverse diets such as gluten and dairy free and vegan. So, the menu included a salad made entirely from garden veg, herbs and wild flowers. Green Goddess dressing was blessed with mint, fennel, chives and parsley. 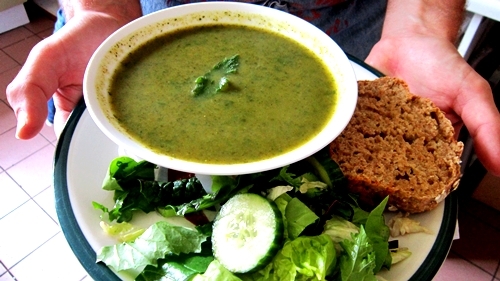 The Nettle soup was light and delicious, including lovage, wild garlic and spring leeks. Penne pasta was dressed with a tangy wild garlic pesto. A spicey corn bread recipe from Coming Home to Cook used chives, parsley and Boghill’s chicken eggs. A blancmange was light and sweet garnished with primrose and violets. Crispy vegan ginger snaps and a fresh herb tea of lemon balm and mint rounded out this exceptional lunch. So, get walking on the paths and lanes and start foraging to make your own! Pick 1 litre of young nettles, preferably tops. Be careful, the leaves sting so pick from the stem. Wash and separate leaves from stem. In a soup pot, drizzle a few tablespoons of Irish rapeseed oil/ Add to it 4 washed and chopped leeks, 1 1/2 cups lovage, 1/4 cup wild garlic leaves. Let cook until greens are wilted. Add 3 cups chopped white potatoes. Cook for a few minutes then add 1 litre of fresh vegetable stock. Bring to a simmer, cook until potatoes are tender. Add nettles and cook for 5 minutes. Puree soup. Add sea salt and cracked black pepper.